To treat aneurysms, two therapy options are available: surgical clipping (craniotomy) or coiling (endovascular treatment). 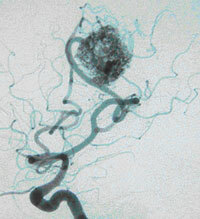 Surgical clipping is a radical cure for aneurysm. Before the surgery, a 3-dimensional scan is used to diagnose the aneurysm and simulate what the aneurysm will look like with the planned craniotomy range, and whether the surrounding blood vessels will interfere with the clipping. In general, craniotomy is performed from the shortest distance to the aneurysm. 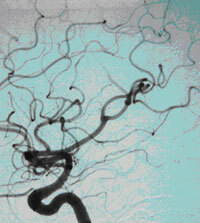 Without making any incision into the brain, the aneurysm is exposed using the space around the brain. After securing the surrounding blood vessels, a clip is placed in the “neck” (narrow part) of the cerebral aneurysm to complete the surgery. Treatment for cerebral aneurysm/cerebral arteriovenous malformation, by inserting a catheter through a pinhole in the artery of the thigh or wrist. An extremely thin catheter is placed inside the aneurysm, and platinum coils are packed inside. 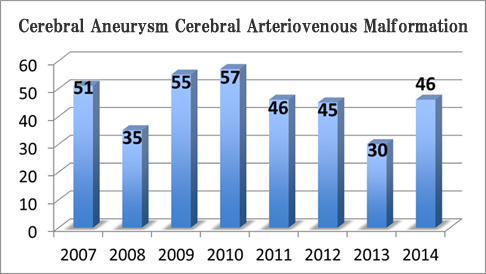 This procedure is preformed to treat cerebral arteriovenous malformation. If the lesion is small, it can disappear in several years, but there are cases where combining with endovascular treatment and/or surgical therapy must also be considered.